This is the 66th (!) in a series of posts on the Nikon D850. You should be able to find all the posts about that camera in the Category List on the right sidebar, below the Articles widget. There’s a drop-down menu there that you can use to get to all the posts in this series; just look for “D850”. The Nikon D850 uses a Sony sensor that, like many modern Sony full frame and APS-C devices, uses conversion gain changing technology licensed from Aptina (Since acquired by ON Semiconductor). That technology is called DR-Pix, and you can read about it here. This approach lowers the read noise for higher ISO photos. In a sense, the camera can be thought of as having two base ISOs. 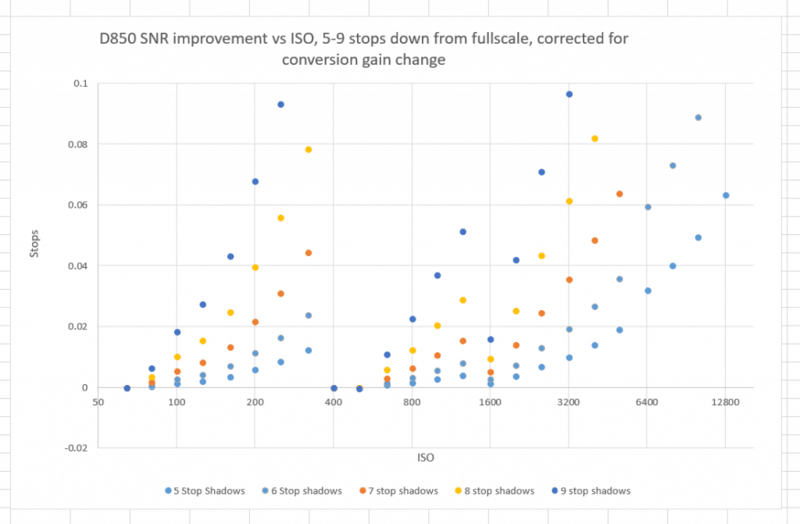 In the D850, the real base ISO of the camera is 64, and the high conversion gain is applied at ISOs of 400 and above, so you could think of ISO 400 as a kind of “base ISO”. What does this mean to photographers? I’m going to look at that in this and the next few posts. This one will cover the quantitative implications. If you’re not a fan of numbers and charts, you’re in luck; the next posts will cover the same concepts visually. Then I’ll attempt to develop strategies for taking advantage of the camera’s characteristics. The change in conversion gain causes the D850’s engineering dynamic range (EDR) to take a jump at ISO 400. You’ll notice that the SNR, when measured in stops, rolls off fairly close to linearly. 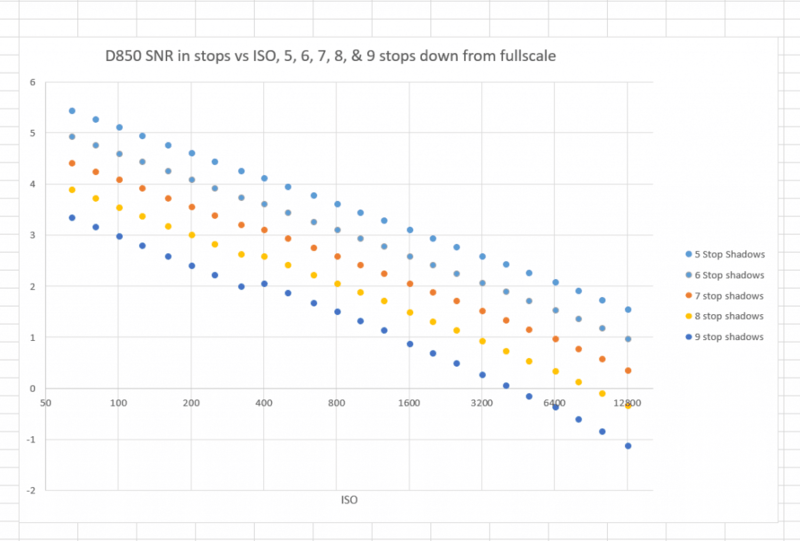 When the SNR drops by half a stop every time the ISO setting is doubled, that’s called “ISO-less” behavior. The noise is entirely determined by the photon noise, which is in turn entirely determined by the exposure. The ISO setting has, per se, nothing to do with it. 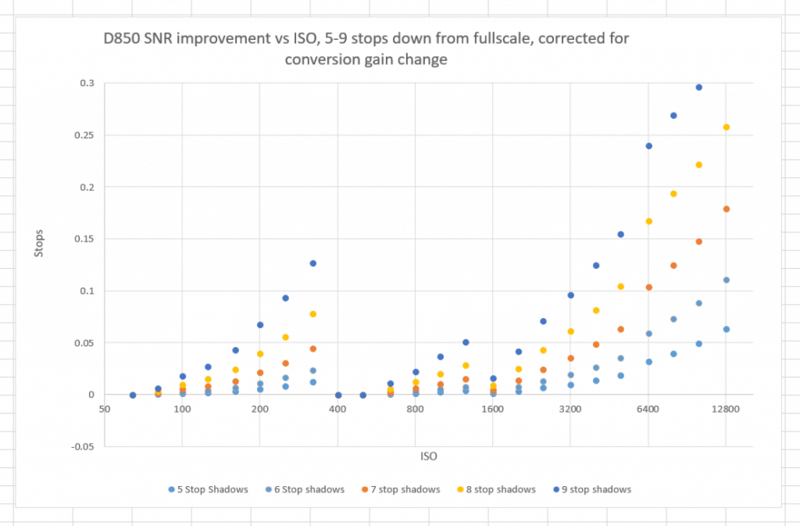 The ISO setting does affect the SNR since we’re measuring it in stops down from full scale, and raising ISO lowers full scale. 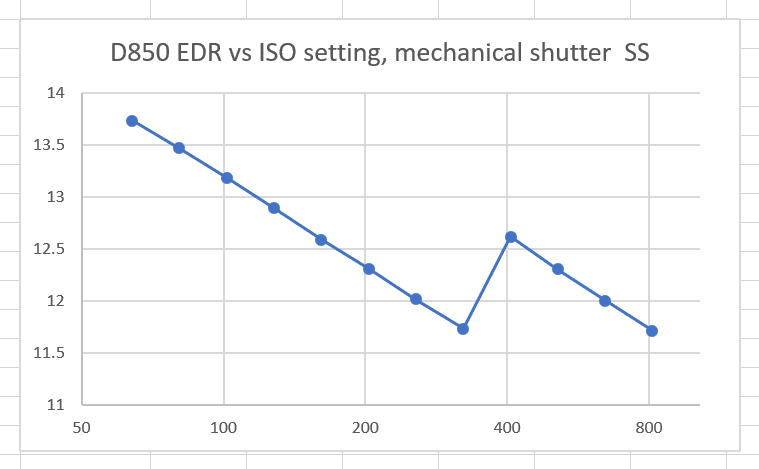 How close to ISO-less is the D850? Let’s look at the improvement in SNR that is created by turning up the ISO as opposed to leaving it at 100, and then switching it to 400. Note the vertical scale; less than a third of a stop from top to bottom. Even with the shadows 9 stops down from fullscale, the D850 is pretty close to ISOless, once you correct for the conversion gain increase as ISO 400 and above. There is some funny business going on at ISO 1600 and above. I suspect digital processing in the camera, but I haven’t been able to prove it. Now the whole vertical span is only a tenth of a stop. 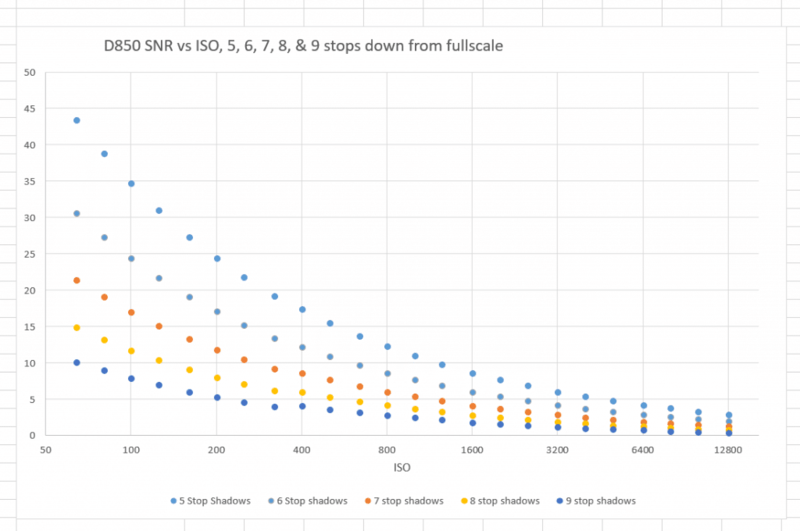 If you’re shooting raw and care only about shadows that are 5 or six stops down from full scale, it’s pretty clear that the ISO knob is not helping. You might just as well leave it at 100 or 400 and push the brightness in post-production. Even if you’re concerned about deeper shadows, the ISO know doesn’t make much difference except for that 320-400 step. 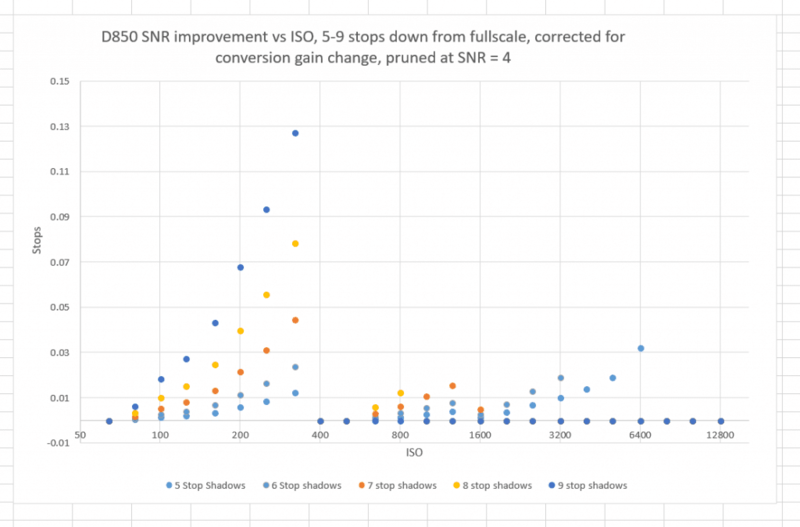 There is slightly more reason to use the ISO control in the 64-320 region than in the 400-1600 one. Now let’s take the above set of curves and prune out all the data with an SNR of under 4. Many people would argue that such noisy information is not photographically useful in many circumstances. Now the case is even stronger that, above ISO 400, you’re at least as well off to set the camera at 400 and push in post. There are practical considerations, and I’ll get to them in a later post in this set. Jim – thank you for working on the 850 again. I will be tuned in for the time to come. Thanks, Arthur. I’ve got one more post to do on D850 exposure strategy, and then that’s all the D850 stuff that I have planned. Of course, I’m always welcome to suggestions, but since the GFX firmware update that added focus stacking, I’m not using the D850 very much at all, so I haven’t discovered new things that I want to test. I might do a comparison of a7RIII and D850 exposure strategies. I suspect they will be very much the same, once a 2/3 stop correction is made to the ISO numbers.